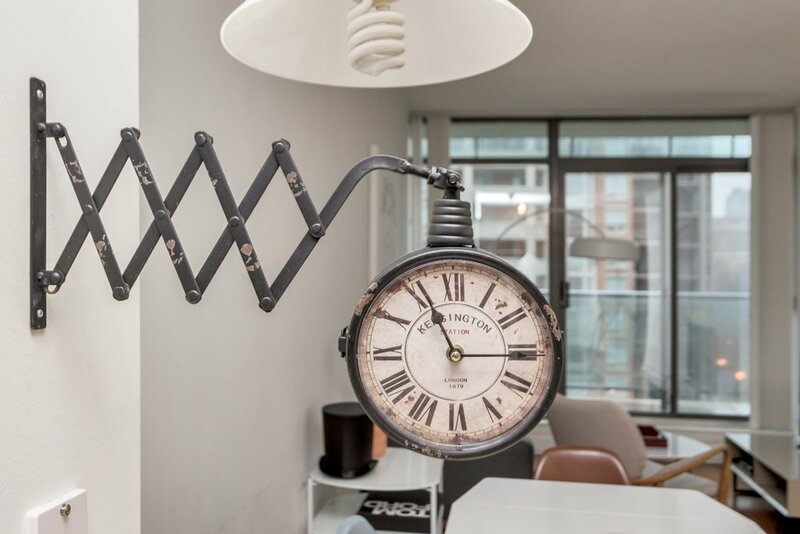 The Yorkville Luxury Condo is a contemporary Toronto furnished rental apartment In Yorkville, Stylish and minimal design, ideal for executive furnished accommodation. Short term rental is available. This modern fully furnished 1 Bedroom condo is located right in Yorkville and has been newly furnished to provide all the comforts and amenities that you would enjoy at home. 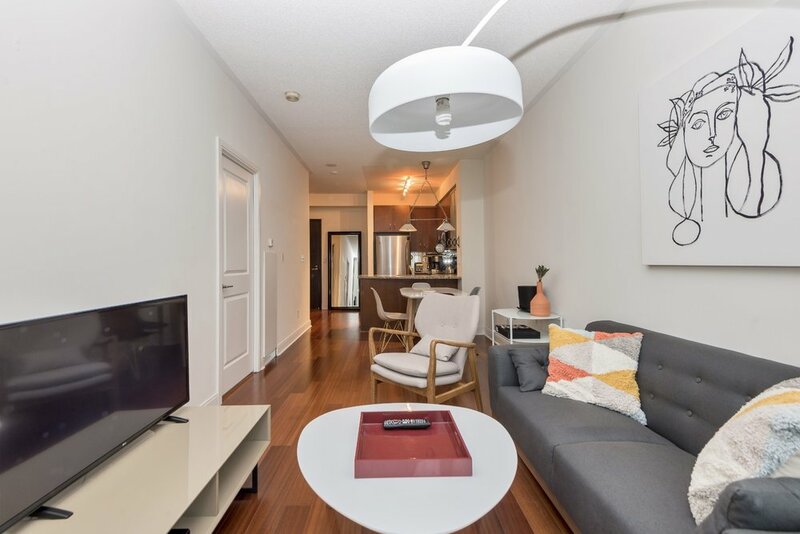 One of our most elegant furnished short term rentals in Toronto, this furnished rental apartment is about 650 square feet large, with a large walk-out balcony. The condo has stylish elephant cherry hardwood floors and plush, cozy carpet in the bedroom. Lounge on the elephant-grey 3-seater tailored upholstery sofa or on the plush Queen size Certified Organic mattress - all necessary bedroom and bathroom linens are provided. Our kitchen comes with all stainless steel appliances and is fully stocked, so you can cook at home during your stay and entertain your friends. This suite is one of the most luxurious Yorkville Furnished Apartments Toronto Suites in our collection. Our lease terms are flexible. An exit cleaning fee of $110 applies. An underground parking space can be added for $200/month. No additional taxes or fees apply to furnished rental stays. All services included with this suite: Utilities, Hydro, Unlimited WIFI Internet, Cable TV Package, Bed Linens, Kitchen utensils, Bath Linens, en-suite washer/dryer and dishwasher. Building facilities include full gym with machines and free weights, spin cycling room, business meeting room, roof-top party deck, Billiard room. The Yorkville Luxury Condo is located in the most prestigious location in Yorkville, beside the new Four Seasons Hotel. All of the city's best boutiques, cafes and restaurants are a 5-minute walk from your furnished apartment, including Prada, Louis Vuitton, COS and restaurants such as La Sociéte, Cafe Boulud, and Buca Osteria. You can walk to several grocery store options in your immediate area, including Whole Foods Market, Longo's Market or the Bloorstreet Market in the Manulife Centre. Request The Yorkville Luxury Condo. We will contact you shortly about next steps! The central Church Street furnished condo is a modern furnished apartment by the Eaton Centre and 2 Subway Stations. Short term rental available. The Scollard furnished apartment is a stunning Yorkville furnished condo in downtown Toronto, with luxury services. Short term rental available. The College Furnished Apartment is an exquisite 1 Bedroom +Den, furnished apartment Toronto suite, near College and Yonge St. Short term rental available. Request The Yorkville Grand Condo. We will contact you shortly about next steps!